Builder/ Floor Layer: Dane and team from Flooring 2 Perfection http://www.flooring2perfection.com.au come highly recommended from the home owner - professional, reliable "and they did an amazing job with our floor. We are in love with it!" Finish Used: "We used Bona Prime Intense/ Traffic Heavy Duty. It has a beautiful matte finish and is suitable for high traffic areas. This was the finish recommended by Dane @ Flooring 2 Perfection". Why the particular grade/size/species? "We live close to the beach so we wanted to use a lighter coloured timber to suit the coastal look. Blackbutt is hard wearing and has stunning knots and veins. We really wanted to get the natural features of the timber so rustique grade was the perfect choice for us". What do you like about the flooring and why? "We love the warm, honey tones of Blackbutt. The features are gorgeous - it's like having nature's work of art on our floor with all of the beautiful knots & veins in the timber! They're also super easy to clean which is a massive plus. The building/renovation project? "This is our first home together and we wanted to buy a place with good bones to renovate. After living in it for just over 12 months we started the renovation of the main floor - kitchen, dining & loungeroom. The house in it's original form was a 1970s style place with plenty of archways, a red, orange and black kitchen, saloon doors and grass green carpet throughout. We knocked out the internal walls to make it an open plan space, moved the kitchen and updated the flooring to timber boards. 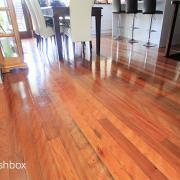 We are very happy with the result and think our Blackbutt floorboards from AST finish the space off perfectly". Why the particular grade/size/species? "I love the different textures that show in the grain and I prefer the wide board to the narrower ones. I chose blackbutt because of its warm, rich, golden colours. What do you like about the flooring and why? "Its easy to clean , lots of beautiful texture in the wood and healthier than carpet which collects all sorts of things!! The building/renovation project? "I chose a very basic home which is as eco-friendly as I could afford within my budget. It was designed to catch as much solar heat as possible in the winter and to be easy to keep clean".